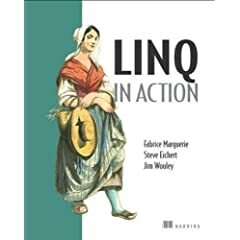 The book covers a lot of topics that emcompass LINQ including LINQ basics, but also LINQ to SQL, LINQ to XML. I like that it starts out with a discussion of the problem and doesn't dive directly into the solution. In addition, I think it teaches the technology without resorting to starting with database applications as the example. Anyone who has heard me talk about LINQ knows that I can't stand that LINQ to SQL is the wrong way to teach it to new people...they didn't fall into that trap. In addition, I really like that there are lots of good examples and a great index. There was never an example I was looking for that the index didn't help me find. That's becoming rarer in books. I really liked their coverage of LINQ from both the consumer of LINQ and the provider of LINQ. Their discussion of the LINQ to Amazon provider provided quite a lot of good insight into how the inner workings of LINQ are put together. My only hesitation at completely loving this book is that all the examples are either in C# or VB. This lends the book to feel a bit schizophrenic. I would have preferred a more bloated book where all the example in print were in both languages. This is especially true of LINQ because the language integration of LINQ is very dissimilar between the languages. Overall, I would recommend the book to anyone trying to learn LINQ as a technology.